The Olympia provide Autism Friendly Swimming Sessions. For more information on what's involved with the sessions, dates and pricing click here. 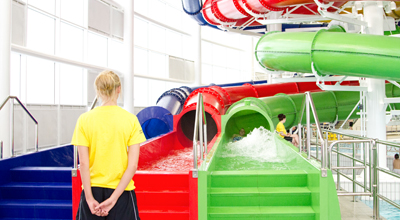 The whole family can look forward to a brilliant day out in Dundee at one of Scotland’s newest leisure pools. Thrill seekers can try out the 4 innovative flumes, with the bravest of all daring to try the cannonball with its 3.8m drop. The leisure pool also includes a rapid river, waves and bubble beds. Why not take a look for yourself in our new Visual Media page and see what we have to offer. Younger children can look forward to splashing around in the toddler’s pool with smaller slides and fun interactive features. This bright & modern venue is also home to a 50m swimming pool, an extensive fitness studio, fitness classes and a public café. If you are planning a visit to our pool with a child under 8 years old, please view our Child Admission Policy. Please view our Opening Hours page for a more detailed description on all of our opening times. Our members with National Entitlement Cards can access our early morning swimming from 6.00am. 30 minutes before closing time for all facilities. Simply read the step by step guide. Send completed form to (as an electronic file or phone photo/both sides): olympia.poolparty@leisureandculturedundee.com. Download our child admissions policy.